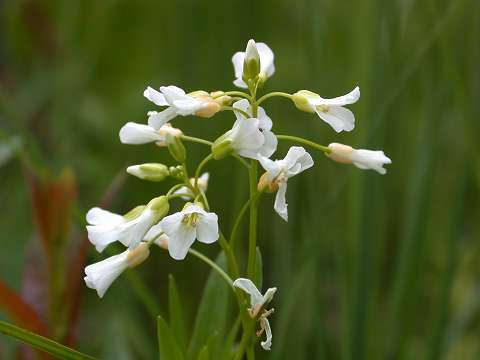 Synonymous with Cardamine rhomboidea (Pers.) DC. Moist woods and calcareous fens. Sometimes in shallow water. Angelica atropurpurea, Caltha palustris, Impatiens capensis, Lilium michiganense, Lycopus americanus, Symplocarpus foetidus. Fraxinus americana, Geum canadense, Sambucus canadensis, Ulmus americana. Quebec west to MN, SD, and KS, south to FL and TX. Perennial from a short, stout, tuber-like rhizome near the soil surface; stems simple or branched above, to 60 cm when in flower. Leaves simple, ovate, subentire to repand-dentate; upper stem glabrous but often puberulent towards the base; cauline leaves 5 or more. Flowers white or rarely pink; sepals green, changing to yellow after anthesis. Fruit slender, to 2.5 cm. This specimen was found growing with yellow star grass, common valerian, and white lady slipper orchids.